A Steel I-beam understructure is typically used when there is a need for a storage area underneath the grandstand. 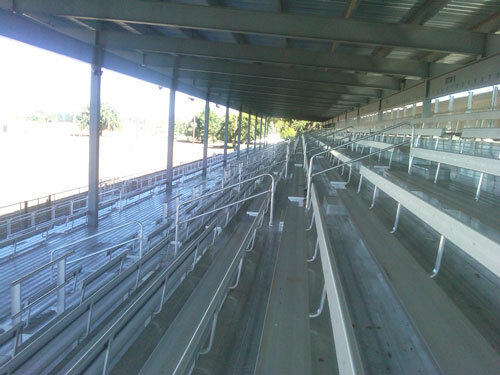 Grandstands are built using “galvanized” or “painted” steel I-beam understructures. Non-Elevated Grandstands – The first row starts from the ground level. 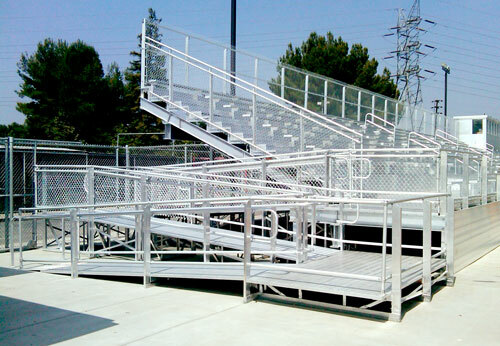 Elevated Grandstands – There is a front walkway typically 30”-40” elevated from the ground which is accessed by means of stairs or wheelchair ramps. Semi-Closed Decking – This type of grandstand decking has open gaps. Fully Closed Decking – This decking provides the added advantage of having no debris come through under the bleacher. The most typical type of seats used for the grandstands is “regular aluminum plank“. A standard rise of 8” and run of 24” can be used as well as higher rise and/or run/tread for more legroom and better sight lines. Stadium Seats is another type of seats used for the grandstands. They come in different styles and colors, giving the grandstand a state of the art appearance and comfort. If the stadium seats are used the rise of 8” or higher can be used, but the run/tread has to be minimum 30″. Grandstands can be built with structural steel roofing systems for additional comfort. 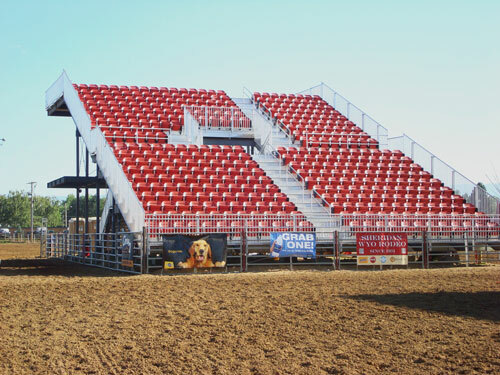 Bleachers International designs, manufactures, and installs aluminum bleacher and grandstand seating systems. We were established in 1993 and the company was founded on principles of honesty and integrity. Bleachers International has commercial general liability, automobile liability, workers compensation and property insurance coverage. We obtain the proper licensure for projects in the locations (states and/or cities) that require licenses. We offer services in the United States, Latin America, Canada, the Middle East, Asia and Europe.